My mother’s name, Yaqout, means Ruby. 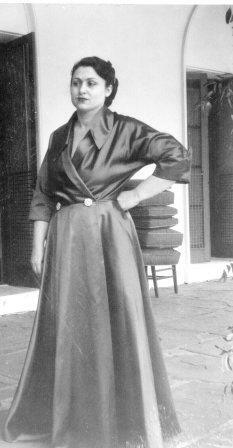 Mamma was born in a small village in the mountains overlooking the glittering Mediterranean and the city of Beirut. She was the youngest or 7 children; 2 brothers, 2 sisters, and 2 older step sisters. We never saw the last two much (they are in the middle at the back). They look pretty darn serious in this photo but in fact my aunts and uncles had a witty sense of humor and warm hearts. Mamma is to the far left, and in the front middle is Sitti (my sweet grandma). Beloved Uncle Yusef to the right, and Uncle Wajih to the left. 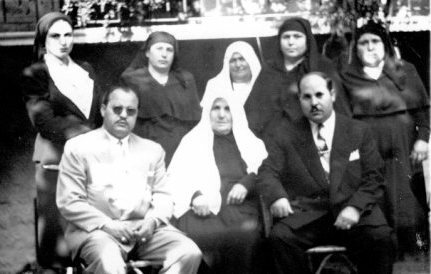 Next to Mamma is my eggplant-shaped Aunt Souad, the Chicken doctor, and to the far right sweet Aunt Salwa, whom I adored. Grandfather was a very good cook, and made most of the meals. My grandma, his young bride, took care of the house and the children, and paid the traditional visits to neighbors. He loved her very much. Mamma learned how to cook from her father. By the time she was 14, she helped make many wonderful dishes. Dad was born in the same village. He was about to start law school when he proposed to Mamma. They lived with Dad's parents. Grandpa was a merchant and traveled overseas, mostly South America, for months at a time. A year later, my eldest sister was born. Grandma was disappointed, since sons were desired to carry the family name, and Dad was their only boy. Dad graduated top of his class and went on to study law at St. Joseph University in Beirut. After completing his studies, he was approached by a cousin of his to consider a job in the newly formed Kingdom of Saudi Arabia. The newly formed country was looking abroad for educated men to help staff their government. Dad received an offer from the Saudi Arabian Ministry of Foreign Affairs, where he was appointed vice-consul, and then consul of the Saudi delegation to Baghdad, Iraq. 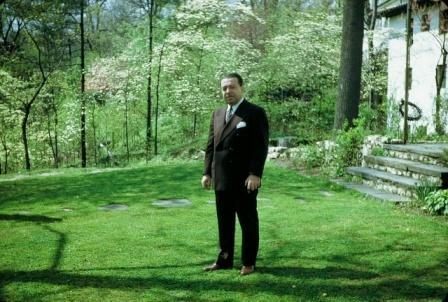 Later he would become a member of the Saudi delegation headed by Prince Faisal that went to San Francisco in 1945 to participate in the establishment of the United Nations. He was very close to the prince and tutored him in French. In 1947, he was appointed by His Royal Majesty King Abdul Aziz as the kingdom's first ambassador and minister plenipotentiary to the United States and the United Nations, then Canada, Mexico, and Cuba as well. Dad and his young family moved to Washington, DC in 1947 and were there until he asked for a transfer in 1955. The family moved back home. 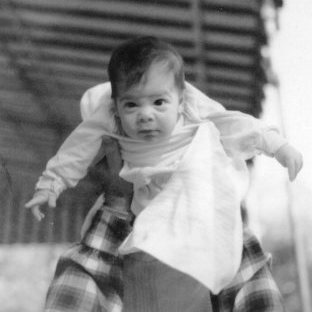 I was 2 months old. Dad became a roving ambassador for the kingdom during the 1950s, serving as inspector of embassies and foreign missions. In 1960, he became Minister of State for Foreign Affairs. He took early retirement in 1962, as I turned 7. I remember sitting at his huge shiny wood desk with paper and ink pen, and pretending to write script and sign my name with a flourish. With these whirlwind changes that life demanded from Mamma, she had to be a quick study in diplomatic life, with no mentor. After almost 2 years away, Dad brought Mamma to Saudi Arabia. At my grandmother’s insistence, my toddler sister was left in her care. Here was Yaqout, a teenager from a tiny village, thrust into a foreign culture where she knew no one. She grew into and filled her role beautifully. She was a gracious hostess and a master story-teller with a wonderful sense of humor. Those two traits won her close friendships with the King’s wives and close companions. Among them she stood out as a ray of sunshine; a source of deep domestic knowledge, a revolutionary thinker (for a woman of her time) and the creator of delightful food and entertainment. She fit right in. This would have been the early 40's…in a country where women did not mingle with men, did not go out unattended, and were not likely to be educated. As a high school graduate, Mamma was an exception among these friends. Her ability to learn and mimic their accent brought them much delight. Only a few years later she and her 6 children were off to Washington D.C. where Dad had supervised the building of the first Saudi Embassy in the U.S. and was ready to welcome them. Mamma had to polish her English, learn to direct a staff and supervise/collaborate with the embassy cook. She made sure it was clear that she was the head chef, and her skills as the consummate hostess flourished. She did all this while holding on to her faith and ethics. She integrated as well as she could into life in the West, sheding her head-cover as long as she was here. But internally, not much changed. They were in DC during the Truman and Eisenhower years. We have letters from Mamie Eisenhower thanking Mamma for gifts of lacy lingerie she brought her from Lebanon, and for beautifully decorated Middle Eastern desserts that President Eisenhower fell in love when he tasted them at the embassy. Long after Dad retired, I remember the frequent visits from members of the Saudi Royal family to our home. The women would congregate with Mamma in one living room, and the men with Dad, usually in his library. The humorous way in which Mamma downplayed their complaints about their lives, relating funny stories about people in our village to entertain them, had them laughing for the better part of their visit. The world demanded that Mamma Yaqout grow up quickly. She had to be strong-minded, mulch-talented, and diplomatic (always with an edge)! Soon she found herself sought after by many, many friends. Her strong, unshakeable faith in God and her strict moral code would be pillars throughout her life. Everyone who met her felt the strength she held, and they were drawn to her confidence, and unwavering friendship. She cared deeply about less fortunate people, reflected in her extensive charity work; loved children (at the time of her passing had 21 grandchildren and 7 great-grandchildren); and loved to have fun. Her many skills guaranteed that we were never bored as children. She was always teaching us something… sewing, cooking, knitting, embroidery, or ironing. She was a rather good still-life artist as well. After he retired, Dad took up oil painting and was masterful at creating rain-drenched city scenes. Mamma ran our large household with the assistance of a housekeeper and two live-in’s, did all shopping (to the farms for produce, the butcher in the next village for specific cuts of meat, to Beirut for fabrics and gifts for visitors, jewelry designers to for presents and milestone birthdays, and the purchase of live stock). She successfully led a team of volunteers to initiate the building of the first hospital in our town, visited sick women in the village, and worked on her 500-page cookbook for 6 years. Not to mention throwing lavish dinner parties that had her in the kitchen for 3 or 4 days. She was also the go-to person when young men in our village needed work! We were 7 children: 5 girls and 2 boys. Since my siblings were much older than I was (2 sisters married Lebanese Americans and lived in the U.S. by the time I was 5 and my oldest brother K. went to college in Oklahoma where my oldest sister lived), most of my life was spent with my 2 sisters A and G, and brother Z who is 9 years older than I. When I was a girl, we lived in a large 4 bedroom flat across from the Seawall in Beirut, while my parents designed and built our home in the mountains. I was around 8 years old when we moved into our new home. It was a 2-story, L-shaped house made of lovely stone block. Mamma designed beautiful living rooms and reception areas on the main floor. All had marble or parquet wood floors. And of course, we had the largest kitchen I have ever been in. The floor was a mix of soft-green and dark green linoleum tiles, matched by the green metal cabinets, and the counters were a swirled pink and white Formica. A breakfast nook where we ate most of our meals, sat adjacent. Our day living room where the piano and stereo sat, had marble floors and Dutch teak furniture. Up two steps and across the foyer were two formal living rooms, an Oriental furnished with wooden mother of pearl in-laid chairs, sofas covered in red silk, screens and vases Dad ordered from Japan. Off that was the Gold room which held a painting of the King and was furnished with gold fabric covered chairs. The house was wrapped on two sides by long marble balconies, the one downstairs for entertaining. Dad's awesome wood-paneled library and a guest bedroom and bath were off the piano room. I was very close to my sister Aida, who was like my second mom. She took care of me much of the time when we returned to Lebanon. I was about 7 years old when she got married. I remember literally sitting on her whenever her fiancé came to visit, so she couldn’t go to out to greet him. They had to sneak out of the house to go for a drive. I didn’t like him much then, but we became very good friends. Dad didn’t like to drive, so he employed drivers, usually one of the men that needed work in our village. The Indonesian gentleman who had been the driver the Embassy in Washington, sought Dad out in 1969 and asked if he could come work for him. He met and married his Argentinean wife, Blanca, when they both worked at the Embassy. Dad was delighted to have him back. Blanca became our housekeeper and her daughter my close friend. We were just a few months apart in age. They lived in the 2 room cottage off our garage. A character that figured in many of Mamma's funny stories was our all around grounds keeper/errand runner Sabir. He was a simple young man that my Aunt knew needed work. He was tall and very skinny, and brought more than a little laughter into our lives! A favorite family story about Sabir is the time Mamma was cooking for a big dinner, and ran out of shortening. She called Sabir and asked him to run down to the market and get a can of Crisco. Then remembering who she was talking to, she reached for the empty can and gave it to him. "Ask the grocer for one of these." "Madame did you want the jar empty like this one, or full?" "I want it like your head. Is your head empty or full?" Smiling ear to ear Sabir replied, "Well, full of course!" "Good, then bring me a full one."